Mexico City is situated in the Valley of Mexico, which is a large valley located in the high plateaus at the centre of Mexico. There are museums, shops and stores, the finest restaurants to dine in, theatres and stunning city views. Taking a guided tour of Mexico City is a sensible choice because this way you will appreciate the history and atmosphere of the city. School info: Colonial style building with two levels, spacious classrooms, small kitchen, common area, and multimedia room. The Angel of Independence is certainly one landmark in Mexico City that stands out. The golden angel stands on top of a victory column, a monument in the shape of a column erected to remember a victorious war or a single battle. The column always stands upon a base as is crowned with a statue, in the case of Mexico City the statue is a beautiful angel. The monument was constructed to commemorate the 100th anniversary of the start of Mexico's War of Independence. The actual column is 36 metres high and the angel is 6.7 metres tall. The angel is covered with 24k gold and weighs 7 tons. As previously stated the Valley of Mexico houses Mexico City. The Valley of Mexico itself is located in the Trans-Mexican-Volcanic-Belt; this belt extends 900km across central Southern Mexico. Many of the peaks have a coating of snow on them for the whole year and on clear days they are visible to people who reside in Mexico upon the high plateaus. For the shopaholics ensure that you visit the Centro Santa Fe shopping centre. The centre houses a 10 screen cinema, play areas for the children, restaurants and plenty of shops. Mexico City has something on offer for all tastes. There are parks, shops, restaurants, historical buildings and monuments and breathtaking volcanoes. 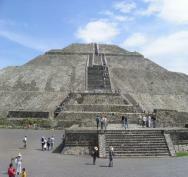 Description: Mexico City is a beautifully complex tapestry of art galleries and culture. There are museums, shops and stores, the finest restaurants to dine in, theatres and stunning city views. Taking a guided tour of Mexico City is a sensible choice because this way you will appreciate the history and atmosphere of the city.